This space will be dedicated to behind the scenes, tutorials, travel adventures, and memories from my life. I hope to be able to share every step of my journey with you. My goal is to travel the world with an open heart and an open mind learning the unique history of each place as I go. Let's be friends and go on an adventure! Click through for access to all of my posts searchable by topic or publish date. New Products in the Shop - Cyber Monday Deals! I am so excited to offer to you a variety of products now available in my shop. From large prints to small prints to calendars and tapestries, each product features vibrant colors sure to brighten up your walls. For Cyber Monday deals - Enter code SMALLBUSINESS at checkout for 20% off. After a few years of road trips and wandering adventures, my trusty travel companion - the Vanguard Havana 41, finally met it's end when a rough zipping ripped the zipper clean off the back compartment. As a replacement, the kind folks at Vanguard sent me a new backpack to take on my travels and so far I've been more than impressed. Meet the Vanguard Havana 48BL! 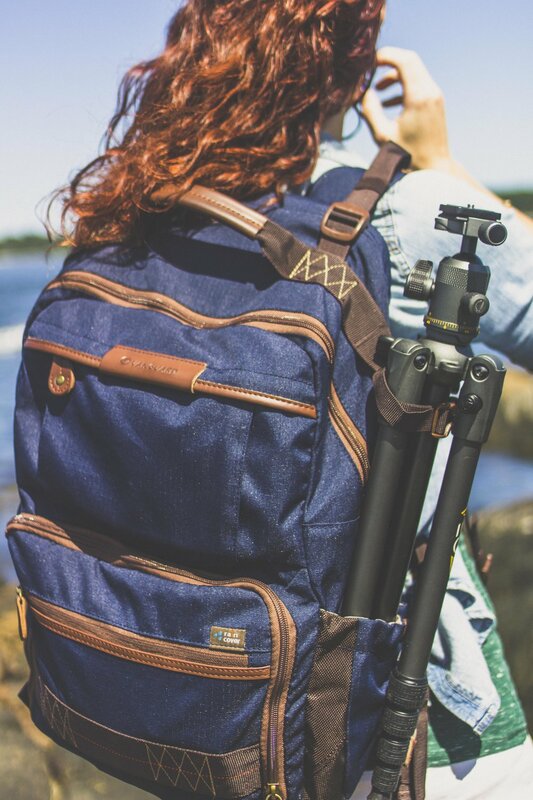 With it's stylish deep navy canvas exterior complimented with brown leather trim (also comes in khaki), the highly photographable backpack looks great in any situation, if Instagram is your thing. 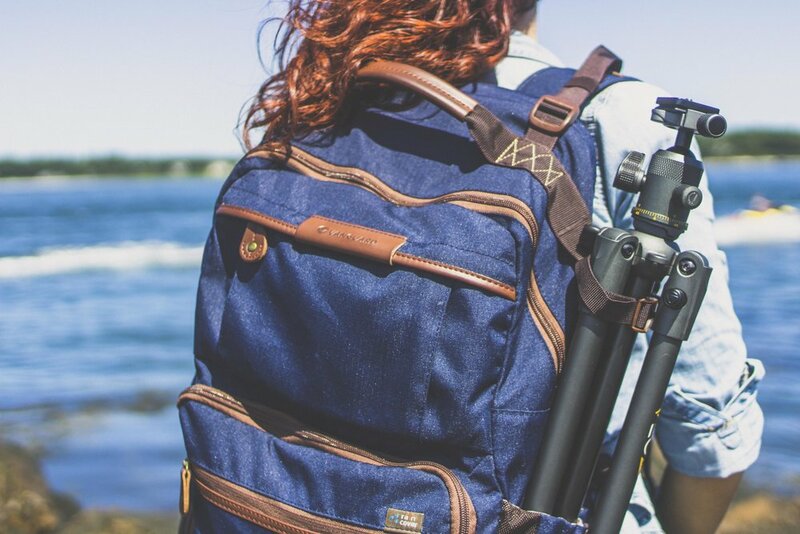 Though created with photographers in mind, the backpack blends in well with standard bags giving that extra sense of security roaming city streets since your backpack is not screaming, "I'm a photographer with expensive equipment!" On the larger size at 48 liters, this bag has been able to fit everything I've needed and more. 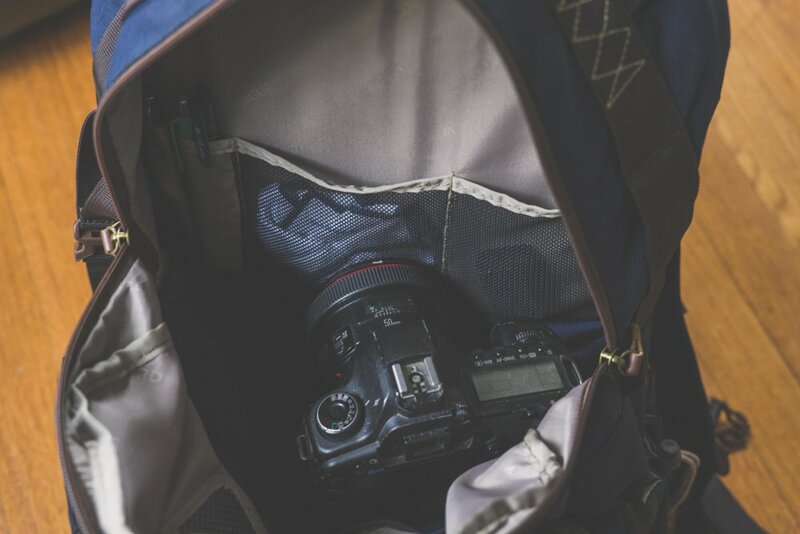 The bottom pocket comes equipped with a padded interior compartment that is easily removable with velcro and top handle for ease of access while offering protection for my DSLR and lenses. Though, I prefer to keep my camera in the top pocket so I can grab and go ready to shoot in under 30 seconds. The Havana has a crazy amount of space with more than 6 pockets for storage. The top compartment has small pockets for quick access to memory cards, batteries, pens, wallet, and passport. There are two side pockets with drawstring for water bottles or tripods. The two front pockets I use for things like business cards and camera remotes. Stitched into the sides are hearty fabric loops for carabiners I use to hang my keys and reflector. 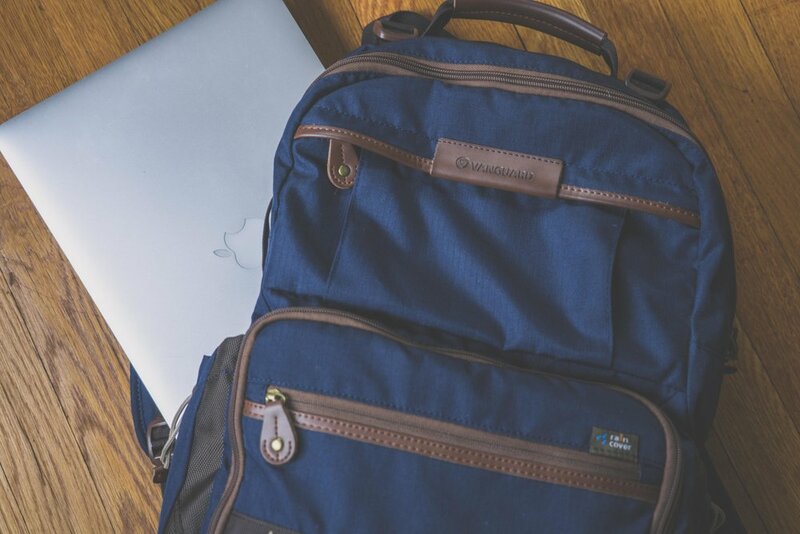 And the best part, finally a backpack that fits my 15.4 inch Macbook Pro - something the 41L never could manage with the corners of my laptop always sticking out. Though feeling a bit bulky at times, I would recommend this bag for those like me who have become accustomed to carrying their whole worlds strapped to their back. 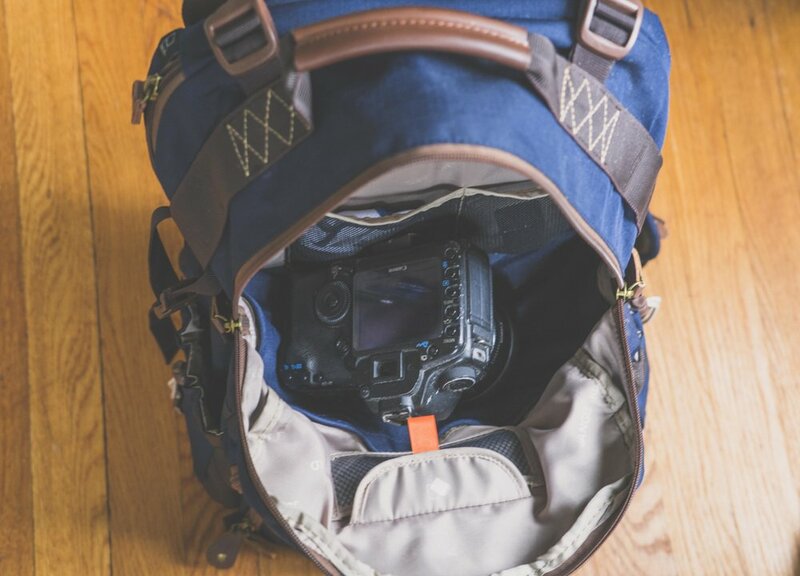 With photography equipment and padded insert removed, I've used this bag for everything from international travel to overnight trips to beach days to long hours editing at a coffee shop. This is the bag I've been waiting for - stylish, great storage, and versatile. DID YOU ENJOY THIS ARTICLE? CLICK BELOW TO SEE MORE! Disclaimer: Although I am a Vanguard Pro Photographer, all opinions are my own and this post was not sponsored or moneitized in any way. Sign up with your email address to receive news, photography and travel tips, promotional codes, and a complimentary Lightroom Preset as my gift to you. For as long as I can remember, my default setting has been one of anxiety — often severe and agoraphobic, wrapped in PTSD, and riddled with multiple panic attacks on the worst days. Being the product of a parent with severe mental illness, it's easy to lack a sense of safety and security with a life built on an unsteady foundation. I did not grow up with the confidence that the world was a safe place, instead shuffling between extreme uncontrolled emotions, multiple divorces, and the quiet dread of instability. Trying to find a piece of solid ground to stand was as though you are trying to find your sea legs in a storm — a great challenge, but not impossible, and a journey filled with the siren call of all the neuroses where you've grown to find comfort, trying to lure you back in. As I progressed into adulthood, my sense of self was disorganized. I was lacking confidence in my own strengths, instead constantly questioning my place in the world. Severely depressed and unable to cope with the overwhelming anxiety of every moment, I could barely leave the house, chronically exhausted from the energy it took just to go to work. When I found photography and starting channeling my emotions in a constructive way, I learned that my anxious tendencies were a necessary product of my upbringing that were no longer needed. That's when my life changed for the better. With practice, I'm learning to go with the flow and embrace life as it comes calmly, without so much hesitation — to take a breath in and let it go in the same way that each moment passes without judgement or projection. Though still persistent even now decades later at 30, the anxiety has decreased in such a way that allows me to push myself through most of the tough days with the mechanisms I've learned to lessen the fearful reactions. My anxiety is like an old blanket you cling to for security, worn and tattered but still I am unable to let go of the comfort that once was so important. Living with the familiarity of your default setting, especially one that was needed to cope, it's hard to challenge your own perspective, but you too can take charge of your future instead of simply treading water. Traveling for all it's privilege, is also stressful, exhausting, and for the anxious among us, can often be an impossible task to imagine. Here are a few tricks I've used to shed the burden of extra emotional weight from severe anxiety while traveling! Due to my overwhelming anxiety, there were years of my life missed because I was too fearful to leave the house. However, feeling the pull of wanderlust since I was a young girl, that anxiety didn't stop me from the dream of packing up all my possessions and hitting the road. With dozens of scribbled pages in my journal dedicated to the hope of giving up the life I was living and having the courage to see the world. All I needed was to gain the confidence to first explore right outside my doorstep. Starting with small steps through neighborhoods near my home, relying heavily on small patches of forest and my DSLR to find my serenity, I started to push back against my anxiety. First a few blocks at a time, then challenging myself for longer distances — taking that first plane ride, that first road trip across the country, and finally stepping foot outside the US and North America. Start small. Gain confidence. With familiarity comes calm. Take the leap of faith into the unknown and trust in yourself. You've made it this far and you can go even farther. I found the best way to keep my travel jitters at bay while I was exploring new locations is to obsessively prepare every detail in advance. Ask yourself, why do you want to take this trip? What's the worst that can happen? What is your main source of anxiety? Prepare accordingly. If I can play out scenarios in my head with the understanding that I have already put steps in place, I am better able to go with the flow. What causes me the most stress while traveling is the idea of getting lost, so I tend to be overly meticulous when planning airport pickups, public transportation, and walking directions. I find myself downloading maps and diligently finding a strategy for which routes I would like to take. 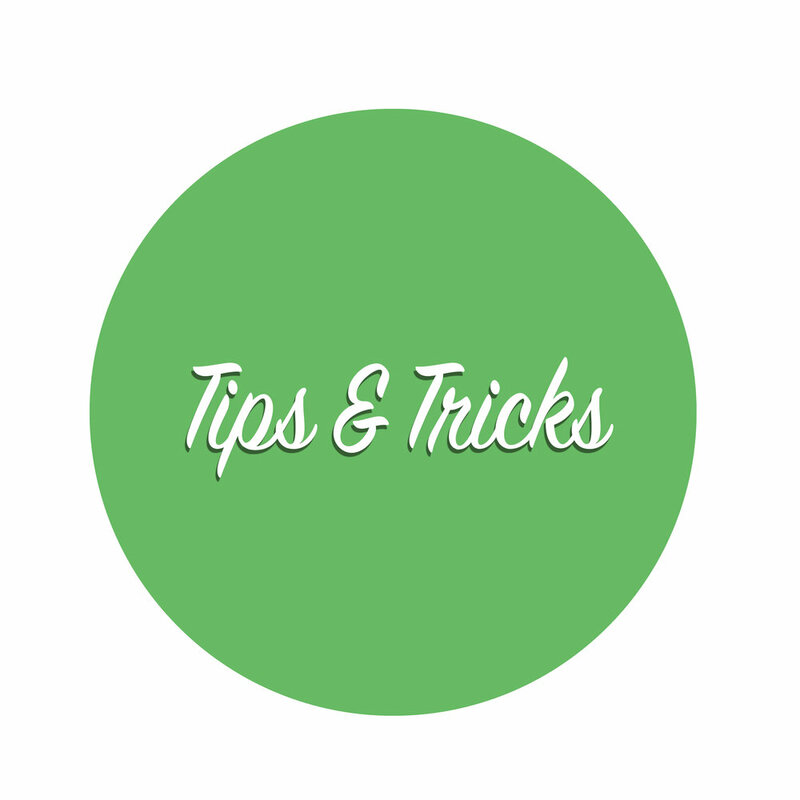 To give yourself extra support, you can even invest in a sim card with international data. For an option that's more cost effective, purchase a local sim card. For an extra sense of security I make sure to purchase travel insurance and back up all my traveling information in triplicate. I'll also bring an extra emergency credit card as a get out of town quick card. Travel smart and be prepared. Over time, I learned that the world viewed through my anxiety filter may not be the real world I'm living in, instead one shaped by my own perceptions and misconceptions. So I try to use perspective to my advantage while using my own little feats of courage as a guide. If I can walk down the streets of my small New Hampshire town I can explore the streets of Istanbul. If I can manage the subway in New York City, I can ride the trains in London. If you've been hopelessly lost in Paris and found your way out, you can find your way out of anywhere! Take what you've learned from your experiences and grow with them. I've also come to the understanding that humans will be humans, good and bad, no matter where you go. In all my travels I've found most people to be genuinely good, kind, and willing to help — I take that perspective with me with the understanding that we are all in this together in the human condition. If I explore with the expectation that people are generally good, but stay aware of my surroundings and mindful of each situation as it arises, I feel a lot safer. There have been many times when I get to the airport and psyche myself out. I can't count the opportunities I've missed because I've just been too anxious to muster the energy to leave the house. How can I possibly get on this plane by myself to a country I've never been? How can I sell myself at a big meeting when my anxiety tells me I'm not skilled enough? The best advice I can give is to try your best to do it anyway. If you have taken the time to prepare, you are ready and you got this! Your knees may be knocking but still take that first step. You may not believe in yourself yet, but take a deep breath and walk through those doors. My aspirations are worth more to me than any anxiety may try to tell me and yours are too. You are stronger than your fears. For those of us who find calm and serenity in your home routines, bring them on the road with you! If you have a daily yoga practice, try to find the time every day while traveling. Do you start your morning slowly with quiet meditation, tea, and reading? Maybe you use your journal to work through the problems of each day. Why not try to start or end your day abroad the same way? When I'm feeling the pull of the stress of a new location, I look to my routines, specifically meditation and yoga, to bring me peace. When I travel, I always find the room in my luggage for a few little personal treasures to take with me. I believe it's important to have something meaningful from home that grounds me back into the present moment. In my wallet I keep photos of my sister and grandmother. I fill the pockets of my backpack with worry stones I've found in my adventures. I bring calming essential oils of lavender and eucalyptus that are used in my diffusers for sleep. I never leave home without my journal. Do you have that one big sweater you wear to sink into and find comfort? Do you have a stuffed animal you cuddle to sleep? Find the things that are important to you and make enough room to bring them. Although it may not be practical, any steps to lessen anxiety are worth it. As luck would have it, I was fortunate enough to be born with a built in best friend in the form of my wonderful twin sister. When I'm with her, I can accomplish anything without fear. 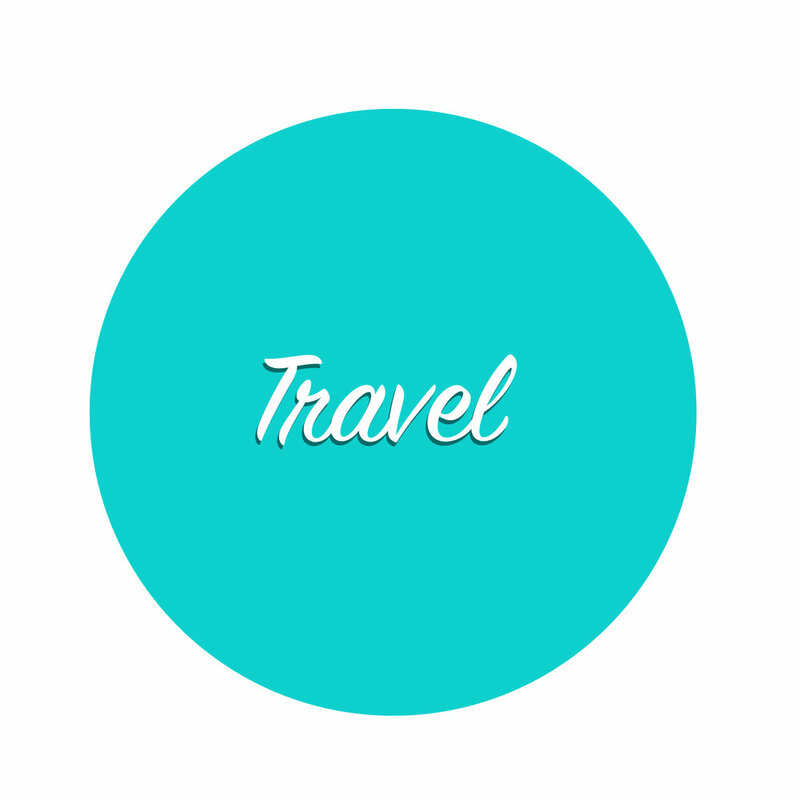 If you are not ready to travel on your own but still want to see the world, why not bring your comfort human with you? 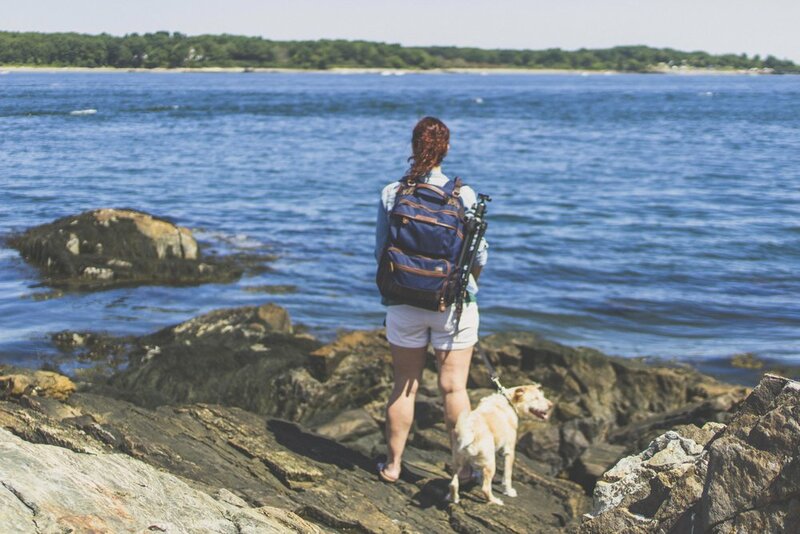 Maybe you even have an animal companion that travels well. Happiness is multiplied when shared, and sometimes it's just easier to have someone there to help solve problems and find comfort when things become overwhelming. Find someone that understands you and is gentle with your limitations to bring along! There are so many avenues to tread to find a sense of calm among chaos. I found mine in Alan Watts lectures with the volume turned all the way up and noise canceling headphones. If you are on a group road trip with not a lot of space or alone time, I can't recommend noise canceling headphones enough. Do you have a mantra? Do you use books to lose yourself? Do you find yourself sketching in notebooks to find serenity? You can bring your calming place with you! For the introverted or socially anxious among us, sometimes it is best to keep an escape route ready. Be it bringing your own vehicle, traveling via road trips with a loose schedule, or even going alone to events instead of with a friend that wants to stay later, it's good to have a way out to rest and recharge. 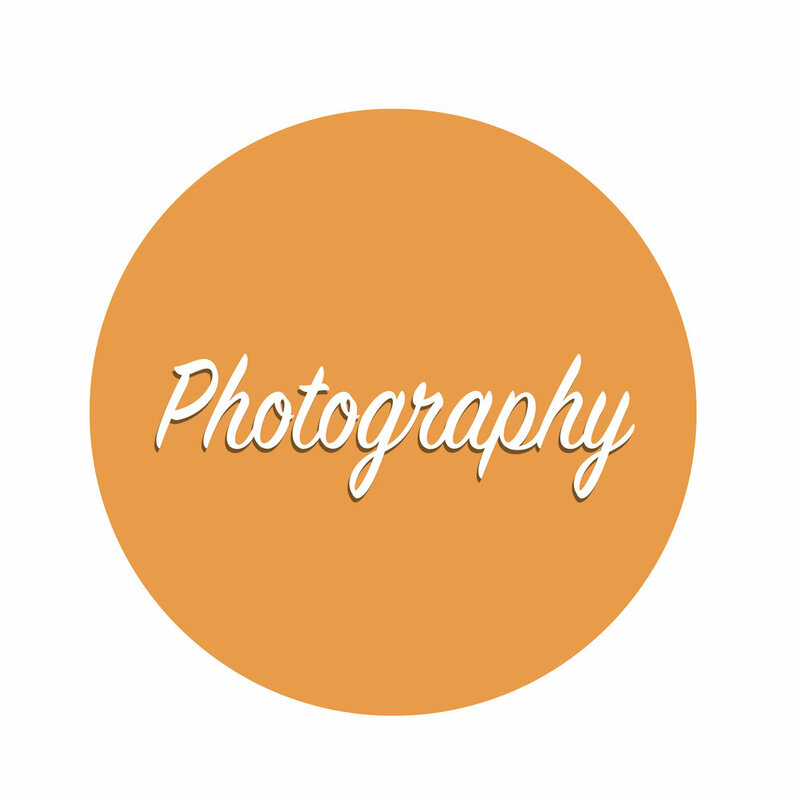 I also use photography in my tool belt of ways to escape. If my focus is on getting that perfect shot, I'm tuned out to the looped negative voice in my head, and I have not as many problems interacting with people. Given something to do and a camera in hand, I'm usually pretty good about navigating emotionally stressful situations. Life doesn't happen to you or for you. Life happens with you, at the same pace, unfolding together in the present moment as if reading chapters of a book. Try to learn to let go of your expectations and know your own limits before you reach them. There is something to be said about trying to let go of your default setting while pushing back against your comfort zone because with practice, everything becomes a bit easier. But after 30 years, I know myself, I know when I've reached maximum capacity, and sometimes when I'm done, I'm done. When it's time for me to leave, I say my goodbyes without guilt, take pride in pushing my boundaries, and make peace with my own limitations. The more you do it the easier it gets. You and your health are your first priority. I know my anxiety will probably never go away entirely, instead ebbing and flowing with my stress levels, but equipped with the learned tools to soften the edges, I know how to give myself the space and acceptance to be me in all my uneasy panicky glory. Some days I wish I could leave the house without all the worries. Some days my anxiety exhausts me before I can even manage the energy to leave the house. But if I wake each morning with the intention to do the best I can - well, there isn't much more I can ask for. Hello! I love new friends! Sign up with your email address to receive news, photography and travel tips, promotional codes, and a complimentary Lightroom Preset as my gift to you. Trail-head: The trail-head is located on Mountain Road in the Wapack National Wildlife Refuge. Trail maps are located in a container attached to the sign. Parking: There is a large parking lot on Mountain Road, extremely hard to miss. Recommendation: North Pack Monadnock is the northern most peak on the Wapack Trail system of 22 miles spanning from Massachusetts to Southern New Hampshire. The Wapack Trail is a historic trail, the first ever interstate trail system in The United States. From the top of North Pack you can continue on further another 1 mile via the Cliff Trail loop or even further on Wapack South 2.3 miles to summit Pack Monadnock and venture into Miller State Park. While exploring the side roads and dirt paths of rural New Hampshire, I accidentally stumbled upon this trail-head and made a mental note to explore. North Pack Monadnock is the northern most peak on the Wapack Trail system of 22 miles spanning from Massachusetts to Southern New Hampshire. Completed in 1923, the historic Wapack Trail is first ever interstate trail system in The United States. With well marked trails in yellow, this hike is easily done solo as it is difficult to get lost if you stay on the paths. If your intent is to summit only North Pack Monadnock, you would have no problem completing this hike in a couple of hours. Starting in the hard to miss parking area of the Wapack National Wildlife Refuge, you will soon find your direction via signs and rock walls. There are trail maps available in a bin attached to the Wapack sign. After about .5 mile you will come to a stream to cross before heading up a path with visible roots and marvelous trees. Beautiful Mountain Laurels lead the way through this section of trail on either side. Late Spring or early Summer will bring delicate white blooms, a small visual treat to stop and enjoy. The trail is well manicured with wooden foot paths over the wetter areas. This passing storm over the mountains was my first glimpse of the surrounding area after a small scramble of granite, soon followed by paths winding through a massive forest of magical ferns. As you are nearing the top, large granite shelves soon brought paths lined with low brush blueberries and juniper. I stopped for a moment to soak in the scenery with some small snakes sun bathing on the warm rocks. As you reach the top you are treated to decent views of the surrounding mountains as well as a large pile of rocks marking the summit. Being a quiet Wednesday afternoon I had the mountain to myself. From the top of North Pack there are a few trails I want to explore when I have the time. The Cliff Trail leads through 1 mile of what I hear to be amazing views that connects to Ted and Carolyn's trails before looping back to The Wapack Trail. You can continue your journey even further on Wapack South 2.3 miles to summit Pack Monadnock and venture into Miller State Park. These trails are all well marked from the summit. Overall, I found this hike to be easy with low grading and fairly nice views. Hopefully I'll be back to try other trails in the area. Trailhead: The trailhead is located directly across the street from 444 Mountain Road in Lyndeborough, New Hampshire. There are no signs indicating the trail so it is quite easy to miss - Helen’s Trail starts between a telephone pole and an old rock wall. Parking: Small parking to the left of the road if heading from Center Road. There will be a flagpole and mailbox to the left of the parking area. 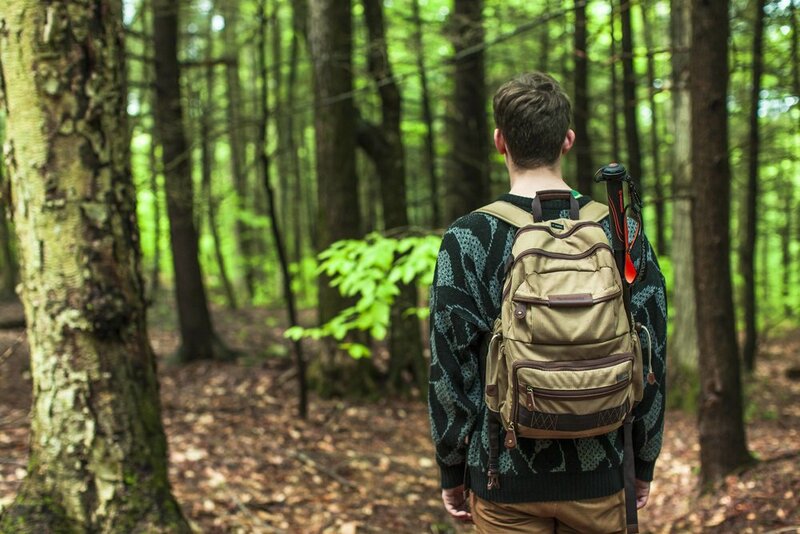 Recommendation: This set of trails connect three peaks for an easy day hike with spectacular views of Mount Monadnock and Crotched Mountain. Mosquitos and ticks were abundant so take preventative measures. It's so nice to be back home again in beautiful New Hampshire recently relocating south from western Maine last month. The holiday weekend, and a very brief window of sunshine, offered an opportunity to have my first camping trip of 2017 so a fellow photographer and I took to exploring just outside the sprawling suburban areas of Nashua about 30 miles from downtown. Finding the trailhead on Mountain Road was tricky as the small paper signs have eroded with time. The trails themselves are also not particularly well marked aside from the occasional yellow reflector or handmade wooden sign pointing the way. Starting on Helen’s Trail off of Mountain Road, rock walls lead the way through the thick forest. Soon you will reach a stream to cross as you pass through the evergreens and into a slow grade. After about 15 minutes you reach the top of The Pinnacle with views of Mount Monadnock in the distance. Heading down from the summit of The Pinnacle is a steeper grading into the woods bursting to life with wild low bush blueberries and maple trees. Come July, the blueberries should be ripe for picking making for some amazing trail snacks. The trail eventually turns into snowmobile trails offering flat and even crossing between mountains. A few days before in preparation for the adventure, I had prepared some lentil chili and rice that easily packed into my cooking supplies. A fellow camper had kindly left a metal grill to use for cooking so we warmed some naan, topped the chili with avocado and reveled in our well deserved meal as the sun set. After dinner and s’mores we explored the area surrounding our camp finding deep purple cones forming on a spruce and cairns pointing the way to Mount Monadnock. At 4am with the moon still lighting up the sky, the birds greeted us with song beckoning us from our tent. During the night the clouds descended to where we slept. 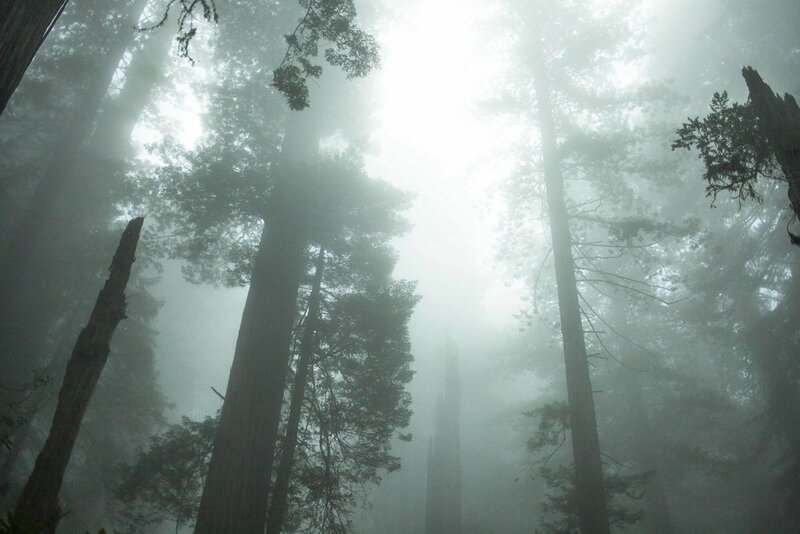 I have always loved the atmosphere fog brings to a photo and here was an opportunity to capture the magic. Although we had hoped for stars, the cool morning breeze made up for the overcast skies. On hike down from Rose Mountain, the conditions were right for encountering New Hampshire's State Amphibian, the eastern newt, with an absolute minefield of the little guys crossing the trails, just as we were. There were hundreds - so much so it was important to be mindful of each step so as not harm them. All in all this was an amazing little hike I hope to frequent while I am staying in the area. The last few years for quick day hikes and a few overnights I've been using my Vanguard Kinray 48 Backpack. 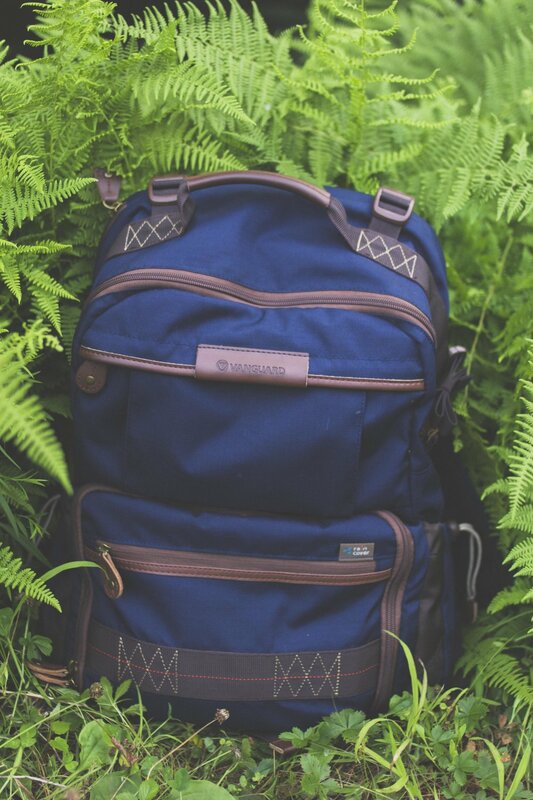 There are plenty of pockets for storage and anything extra can be clipped via carabiners. Unfortunately this isn't a style that Vanguard makes anymore but it's served me well in my travels.